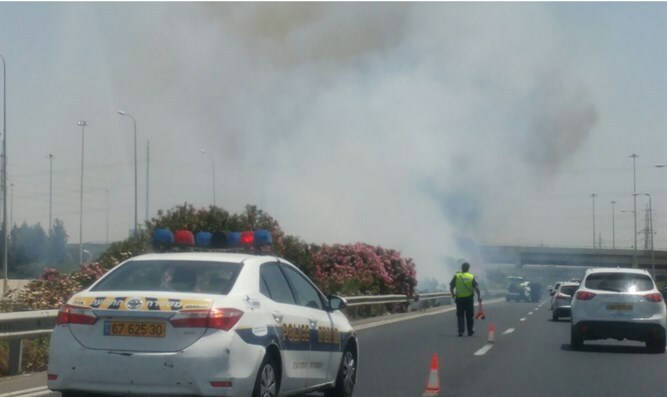 Brush fire forces closure of Highway 1, train station causing jams; Israel Railways provides shuttles for those traveling to airport. Highway 1 was closed on Monday afternoon as a result of a brush fire which broke out near the road. Traffic in both directions was closed from Ganot Interchange to Shifirim Interchange. The road was reopened after one hour. Israel Police said a squad car was positioned near Highway 4 in order to direct traffic, and that traffic was heavy between Kibbutz Galuyot Interchange and Ganot Interchange. Traffic between Lod's train station and Tel Aviv's Hahagana train station was also stopped. Instead, southbound trains originating in Haifa ended at Tel Aviv Hahagana, an northbound trains from Be'er Sheva ended in Lod. Israel Railways ordered shuttle buses to transfer passengers between the Lod and Tel Aviv Hahagana train stations. The trains running between Be'er Sheva, Ashkelon, Tel Aviv, and Hod Hasharon are all running as usual; however, the train to Ben Gurion Airport ends at Tel Aviv Hahagana. Shuttles will take airport-bound passengers from the train station to the airport.